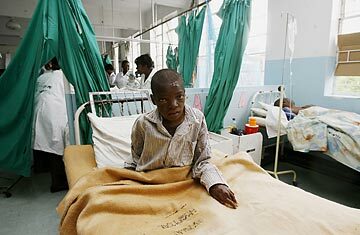 Zimbabwe: Will Cholera Return with the Rains? In ordinary times, the people of Zimbabwe would celebrate when the heavens opened up with rain that would soak their fields and ensure their harvest. But there have been no ordinary times in Zimbabwe for years under the authoritarian rule of Robert Mugabe. For residents of Chitungwiza, a bedroom suburb 30 miles southeast of the capital Harare, the rains have renewed fears of cholera. This is where last year's outbreak of the disease started. Eventually, it would claim close to 5,000 lives in the country of 12 million. Borne on infested, waste-filled water, the intestinal ailment may ride the rains to a new onslaught on the country. According to the United Nations, there have already been five cholera-related deaths and 116 people have been afflicted with the disease since September. The government does not recognize any imminent crisis. "We are in control of the situation and hope that there are no further deaths and cases to be recorded," declared Henry Madzorera, Zimbabwe's Minister of Health. "Those who died could have died because they failed to get to hospital on time." But it is the shortage of clean water, as it was last year, that is now at the heart of a potential cholera outbreak. A visit to Chitungwiza reveals that public water shortages are still common, forcing residents to resort to unprotected sources such as wells and creeks. Meanwhile, the bankrupt local government has left garbage uncollected and has allowed maintenance to falter, so that sewer pipes frequently burst, further tainting the available water. "We can go for days without water; we have not had it for the past three days. Every time that happens I fear that cholera will come again as what happened last year," says Eremencia Kachoto, an elderly resident of nearby Saint Mary's. She adds: "Now that the rains have come we have resorted to harvesting water. Otherwise we would be relying on water from wells. We then treat it with tablets we get from clinics to prevent cholera." She complains that the government should not have let its citizens descend to such a plight. Just down the road from Kachoto's residence, in Zengeza, are piles of uncollected garbage. Sewage flows as children play in the muddy streets. There, another resident, Desire Kachepa, says town authorities are "letting them down" by not collecting refuse. Garbage has been uncollected for weeks. "Hence you are seeing us throwing it near the road," says Kachepa. "Water shortages have remained part of our lives here. With the rainy season now with us cholera is likely to come again because sewage is flowing into wells from which people get water for drinking when there is no tap water." Another Chitungwiza resident, Farai Tayengwa, says that since the elected Chitungwiza Town Council came into office last year there have been some improvements. "Unlike in the past, if we report a sewer pipe burst [the council will] come and attend to it immediately. But they must improve on refuse collection. I am not sure when they last collected it here." Tayengwa lives just across a road almost closed off by dumped refuse. "This is worrying, especially when we have heard of outbreaks of cholera in some parts of the country. I hope we will not have a repeat of last year." It has been nine months since Mugabe formed a coalition government with his chief rival Morgan Tsvangirai, but Harare is not yet able to provide adequate health facilities for its citizens. Most residents in the capital and its environs depend mainly on the U.N. and other international agencies. Tsitsi Singizi, a UNICEF official, says her organization is not anticipating huge deaths as was the case last year. "After it was realized that cholera was inevitable this year, there has been a lot of planning and preparing ahead of the rainy season. You cannot say with certainty but [cholera] is not likely to be as ravaging as late year." Nevertheless, she adds that her organization is supplying hygiene kits to 5,000 schools to prevent cholera. Until public sanitation improves, the ghost of cholera will continue to haunt Zimbabwe. Read "Even with a New Government, Conditions in Zimbabwe Worsen."